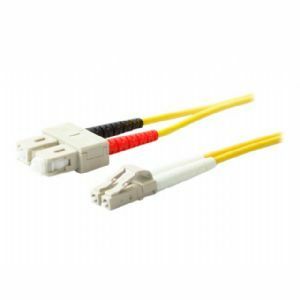 AddOn's 10M Single-Mode fiber (SMF) Duplex LC/SC patch cable is an economical solution which provides high bandwidth and transmission rates over longer distances. With LC to LC termination, this high-quality single-mode fiber optic patch cable is expressly designed for Gigabit Ethernet applications. The injection molding process provides connection greater durability in resisting pulls, strains and impacts from cabling installs. A pull-proof jacket design surrounds the popular 9/125 single mode fiber, immune to electrical interference.